Having the right tools makes getting the job done that much easier; that’s particularly true when the tools come from the kitchen pantry. Just ask Stacy and Mark Conley, owners since 2014 of The Oilerie in Village at Wexford on Hilton Head Island, where they certainly have all the right tools to get the party started. “I love to entertain,” Stacy said. “That’s why I’m entertaining a private party here at the shop tonight. I cook for them, they bring their own alcoholic beverages, and I make a strawberry balsamic lemonade.” Using the olive oils and vinegars, spices, rubs, sauces, relishes, garnishes, dips, and toppings, from the shelves of their cozy shop, the Conleys make a little culinary magic and enjoy sharing their secrets and selling the ingredients that make dishes and drinks dance. With a selection of 18 extra virgin olive oils, five nut oils, and 11 balsamic vinegars, including The Oilerie’s own decadent balsamic, aged for 25 years, customers will find classic flavors and special favorites in stock and discover custom taste combinations with every visit. Each bottle is decanted from the shop’s beautiful, shiny canisters, corked, sealed, labeled, and dated with their signature brass tags. “We want everyone to make themselves at home,” Stacy said. “After doing some tasting, or whenever you’re ready, we’ll fill the bottle for you. Take your time; mix and match. Create what you think will be the best combination for you.” Customers are also encouraged to wash their empty Oilerie bottles, bring them in for refills, and save a $1 on each bottle—good for the wallet and good for the environment. The Conleys have a knowledgeable and tightly-knit team, including Laurie, their shop right-hand (and left-hand, Mark said), long-time part-timer Karen, daughter Kallyn, a recent college grad and area substitute teacher, and daughter Lisa when she’s on summer break from her studies at Clemson University. 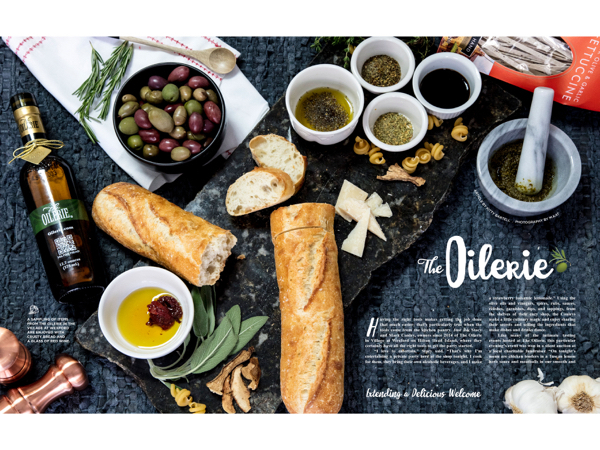 Whether greeted by Stacy, Mark, or one of their staff members, customers are encouraged to enjoy samples and tastes and discover the various lines of specialty foods at The Oilerie. In addition to the amazing tastes and flavors, the health benefits of olive oils are an important part of what the store’s team shares with customers. “There’s an American Medical Association study that says that two tablespoons of olive oil a day reduces bad cholesterol by about 15 percent,” Mark said. Mark and Stacy Conley at the Jazz Corner in the Village at Wexord. 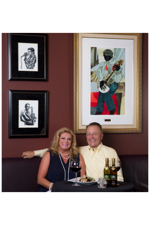 The Jazz Corner is one of many local restaurants featuring their olive oil and balsamic vinegar. The best ways to keep up with the latest happenings at The Oilerie is to follow them on Facebook and stop by the shop, and stop by often. About twice a month (more if we’re lucky) Mark shares yummy recipes, featuring their products, on Facebook. Offering the most personal of customer service, there is something for every personal taste in their welcoming shop, and the staff will creatively assist with gift giving, with beautiful packaging and arranging delivery. The Oilerie is located in Village at Wexford, 1000 William Hilton Parkway, Suite C2. For more information, please call (843) 681-2722 or find them on Facebook.